A 30-minute block for either an elective or extra support made small-group interventions feasible in large classes. Humboldt Elementary made time for small-group work through a program called I Choose. This 30-minute block of time allows fourth, fifth and sixth grade students to rotate through various interventions within RTI or attend their choice of electives including peer tutoring, library, physical education, computers, or music. The program allows teachers the time for small group work that they'd requested and gives the students a mix of valuable supports and enjoyable enrichments. I Choose is a 30-minute block of time during the day that allows fourth, fifth and sixth grade students to rotate through various interventions within RTI or attend their choice of electives including peer tutoring, library, physical education, computers, or music. The program allows teachers the time for the differentiation they'd requested and gives the students a mix of valuable supports and enjoyable enrichments. "We knew when we got together that motivation is a huge aspect to student achievement," says former Principal Cole Young. "We all do things for reasons, and we are asking kids to jump grade levels in a year in regards to just their academic proficiencies. And so in knowing that, there also had to be some things that would have to push them, that would motivate them, that would have to be a part of our process." By allowing students to choose how they wanted to spend the last half hour of their day, Humboldt empowered them in terms of both their activities and their learning. "You have to have a hook for every kid to do the best that they possibly can," Young says. "When we talk about reaching your potential, we want you to exceed your potential and you be the one doing it. It's not the teacher doing more work than the child, it's the child wanting to do it and meeting the teacher at least halfway, if not more." I Choose is part of a comprehensive motivation program that "not only pushed the top, but also pushed the bottom." The leadership team began looking strategically at the school schedule and amalgamated spare minutes to form a 30-minute period at the end of the school day four times a week. "We're asking actually more out of our elective teachers because they teach a certain number of periods a day," former Principal Young says. "We're saying, 'Can you give us half an hour more?' When they saw the big picture and we started to talk about it, it made sense to them. They understood this was helping school-wide." Another way that Humboldt worked out scheduling kinks was by collaborating among the teachers to spread the subjects and work across staff and grade levels. One teacher may become a math teacher when it's time for I Choose, working with kids from other classrooms on their math skills, while another teacher may work with a group on reading or science. Teachers can determine whether a child needs more help in a certain skill, or extra attention to master a concept. Parents can request that their children stay in for interventions as well, if they notice their child needs help with a particular skill. The school's intervention team can also identify kids who are struggling with a particular area and group them together during I Choose for additional support. Students can choose to stay in their classroom if they want to finish their homework or some additional classwork. I Choose also varies depending on what skill is being examined that day. Some days the teacher may choose to check students' reading comprehension, while it may be math on other days. This ensures that all kids get some opportunities to choose an elective, and that all kids get opportunities to receive additional dynamic instruction in a smaller group. Humboldt students are continually monitored for progress so that teachers have regular feedback on where students are. This includes the interventions happening during I Choose. From the benchmark exams that all students take at the beginning of the year, teachers develop an idea about which groups of students may need additional help on specific skills, such as math or reading. Once the students who could benefit from intervention have been identified, they are given a pre-assessment, which both records where they are before intervention and drives the teacher's instruction of their group throughout the intervention. Teachers can then look at the pre-assessment results and group students even further depending upon the academic gaps that have surfaced. Students then receive interventions for six weeks before they are tested again. The six-week intervention is organic in nature. There is no predetermined grouping, as all data needs to be used in a timely manner to effectively administer small-group instruction based upon students' individual needs. When identified, each student is given an individual learning plan customized to their learning and specific academic needs. After six weeks of the students receiving specific interventions during I Choose based on their academic profiles, a post-assessment is given, which is identical to the pre-assessment. From comparing the results, teachers verify the credibility of their interventions as workable solutions that they can use again for other students experiencing the same academic issues. Throughout the six-week period, teachers are evaluating student progress as they check for understanding through informal and formal assessment. This way, teachers are not required to wait six weeks to determine whether their researched-based instructional practice is working. They can change their practice quickly to maximize their time and efforts with students. Logistically, giving fourth, fifth and sixth grade students the ability to transition between classes on campus was "scary" at first, says Young. Initially, there was no list of who was going where, and the aides on duty during the transition had a tough time figuring out how to monitor where everyone was supposed to be. Now, the classroom teachers send the office a list of who is going to what elective by lunchtime so that the enrichment teachers will have a roll they can check against that afternoon. Young also faced initial pushback from teachers concerned about losing valuable instruction time in their already-busy schedules. Keeping a close eye on data and sharing the measurable gains in student achievement is what eventually got everyone on board with the program. For Young, the proof of the I Choose program's success is in the data. 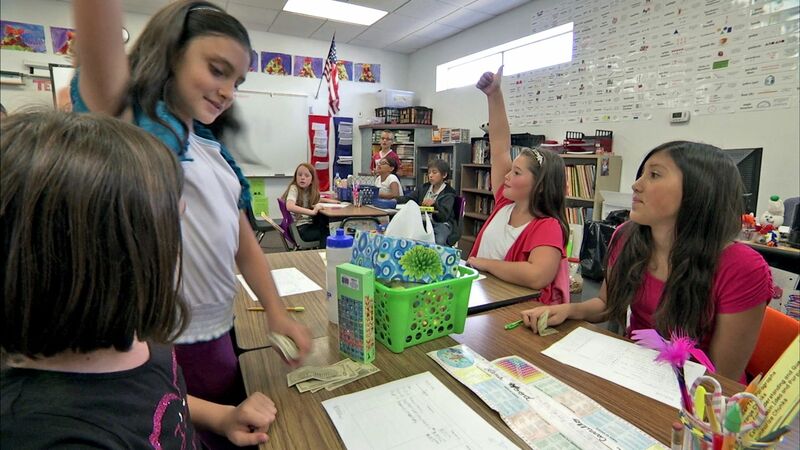 Humboldt Elementary has seen rising success rates for their students across the board, and the pre- and post-assessments of students show teachers that the interventions in I Choose are working. The byproducts that Young didn't anticipate, however, were the school-wide improvements in positive behavior and the sense of ownership and power that the students felt from knowing they has a choice. "We pushed all these kids, not just the ones who needed intervention," Young says, "and they benefited from knowing they had ownership in what they were doing at the end of the day." Data is from the 2014 academic year.